ZAPPA OFFICE on Larchmont was the venue for an LBA mixer where attendees included, L-R: Liz Fuller, Patty Lombard and Karen Evans, all of the “Larchmont Buzz,” and Bob Day, of Coldwell Banker. Every summer, the venerable 124-year-old Ebell of Los Angeles welcomes new board members. The installation of these ladies was fêted with a gala luncheon in the Grand Lounge of the Lucerne Boulevard club on June 25. This year they also inducted a new president, long time Ebell member and former Deputy Chief of Protocol for Los Angeles County, Ginger Barnard. Ebell’s chef Dan Cincis prepared a lavish three-course meal accompanied by musical entertainment. Among club members and their guests in attendance were Carolyn Layport, Natalie Battersbee, Sandy Boeck, Caroline Moser, Janine Missimer, Kay Balue, Gerry Apostle, Carolann Bennett, Myrna Gintel, Laura Cohen, Dennee Frey, Cynthia Comsky, Mary King, Carrie Perry, Fluff McLean, Donna Russell, Angela Sacchi, Dia Schuldenfrei, Amy Sinclair, Maria Wohlmuth and new board members Perry Maiorana, Lorraine Spector, Gerri Hurley, and Laurie Schechter. A similarly festive gathering took place a few days later in an upstairs office on Larchmont. 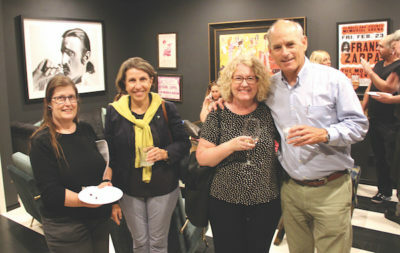 The Larchmont Boulevard Association gathered members for one of its periodic mixers, and lots of merchants showed up to enjoy the hospitality of LBA member and Hancock Park resident Ahmet Zappa. The Zappa office walls are covered with Frank Zappa art and memorabilia and provided a fascinating setting for the reception, organized by LBA board members Bob Day and John Welborne. “But Ahmet did most of the work,” said Bob. Attendees included staff from the “Larchmont Buzz:” Patty Lombard, Liz Fuller and Karen Evans. In addition, Steve Cohen, Pam Rudy, Edie Frere, and LBA president John Winther were among the luminaries. Back at the Ebell, the previous week, the club hosted chef Jenn Segal, author of the new cookbook, “Once Upon a Chef” and creator of the popular blog of the same name, along with Daphne Brogdon, comedienne and host of the television Food Network show “Daphne Dishes.” Ms. Segal spoke about her path from being a classically trained chef to a mom and blogger, combining her skills with fresh and accessible ingredients for fail-proof family meals. Nibbling mouth-watering samples from a buffet of recipes featured in the cookbook were past Ebell president Loyce Braun, Mary Nelson, Elizabeth Blatt, Sonja Carlin, Diana Larson, Toni Jones, Jackie Kruse, Julie Johnson, Beth Lee, Rachel Crook, Mary Gillette, Martha Tynan, Daphne and Carole Brogdon and Janna Bodek Harris. See all of you at the very best barbecue of the season in the garden of the Ebell on Fri., Aug. 3. Just give them a ring for your reservation: 323-931-1277.